Registration is still open for this workshop. Note: It is not necessary for participants to stay at the hotel where the workshop takes place, however if you do wish to stay there, a few rooms at the group rate may still be available – although it does not show on our direct hotel link. Contact us for details. With Holotropic Breathwork each participant gains direct access to his or her own inner healing wisdom. In your HB session, this wisdom brings you a unique and ideal combination of experiences that can include aspects of your personal history and birth, as well as psychological death/rebirth, and an infinite array of transpersonal experiences. 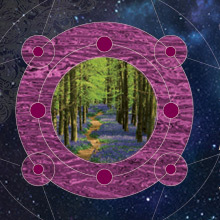 Through breathing, a specially designed musical journey, and a safe and supportive setting with a trained staff of facilitators, you experience a true expanded state of awareness, allowing deep self-exploration and personal transformation. Mandala drawing and group processing of the experiences are important integrative elements of the Holotropic process. In addition, there will be a presentation of the breakthrough “APS” (Awareness Positioning System) technology, developed by Tav Sparks, which can be used to apply the principles of HB to enhance and upgrade your everyday life. By using this practice, every outer experience can become an opportunity for transformation and self-empowerment. REGISTRATION IS OPEN, AND YOU WILL BE ABLE TO COMPLETE ALL FORMS AT THE DOOR. You can still use the link below to pre-pay for the workshop. Note: Exact times are subject to change.